In Flanders, lace is not merely a craft but a part of the region's cultural heritage. The roots of Flemish lace go back as far as the 15th century, and remain strong, with today's designers producing stunning creations. To tell the story of lace, we have to go back a good 600 years. A great many Belgian artists were experimenting with artistic fabrics at this time. 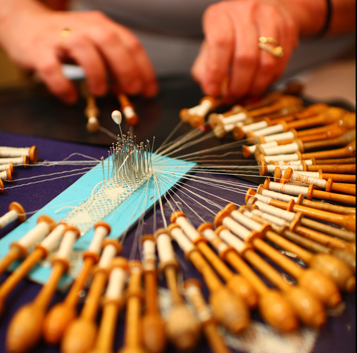 In the beginning, the main kinds of lace were bobbin lace (using bobbins) and needle lace (using needles). Many new variations would be created in the centuries to come. In the early 20th century, there were approximately 47,000 lace makers in Belgium. Around 70% of these worked in Bruges, which led to the founding of the Bruges Lacemaking School in 1911. Girls from 14 and up were taught about lace, but also received lessons in religion, arithmetic, trade and political economics. They made lace fringes for men's and women's clothing, as well as entire christening dresses, special collars and cuffs. Other lace creations were often framed behind glass. Later would come the introduction of machine-made lace—however, this was but a cheap alternative for sophisticated, traditionally made lace. Headed for Flanders and interested to learn all about the world of lace? The Bruges lace school of the Apostolic Sisters recently moved to the brand-new Kantcentrum (Lace Centre), also home to a fine museum. “Look but don't touch”? Far from it! The new Lace Museum is a hive of interactivity and multimedia installations. You can even learn some of the tricks of the trade. In the Folklore Museum, in front of the Lace Centre, you can admire more lace and learn more about the social conditions of the lace makers.